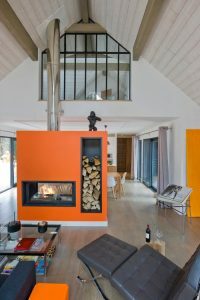 Thanks to a renewed interest in Mid Century and Mid Century Modern architectural design as well as an increased interest in modern design, orange has taken its rightful place in interior home design. 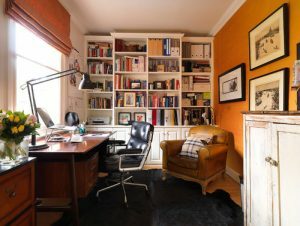 “Orange sparks controversy and strong reactions,” notes Rebekah Clark, owner of Decorating Dens Interiors at Clark Team Designs. Generally, you either love it or hate it. Mid Century Home with wall painted orange HausZwei Homes Kevin Polite Solid Source Realty, Inc.
“Orange is one persnickety color, because it goes from burnt umber to caution cone very fast,” points out Justin Riordan of Spade and Archer Design Agency. This is a shade best suited for an extroverted homeowner, as it exudes enthusiasm, excitement, and warmth, adds Clark. And if you’re a fan, orange is currently having a moment. “Rust and Hermès orange are definitely trending—shoppers on our site adore it in velvet and mohair upholstery, lacquer furniture, and decorative pillows,” adds Anna Brockway, co-founder of Chairish. For most homeowners, baby steps are recommended. To help, here are nine ways to work this unusual shade in your home. 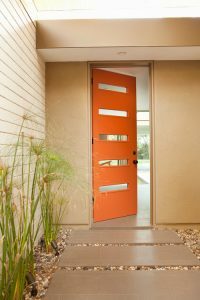 Mid Century Home with Modern Door painted orange HausZwei Homes Kevin Polite Solid Source Realty, Inc.
Spice up an otherwise drab front door with bright orange, recommends Riordan, who likes a high-gloss version of Benjamin Moore’s Topaz. “You’re adding interest, creating a focal point, and improving your curb appeal—all at once,” he says. Photo by Jagoe Homes Inc.
Color pops work well in small spaces, including a hallway, wet bar, or half-bath. 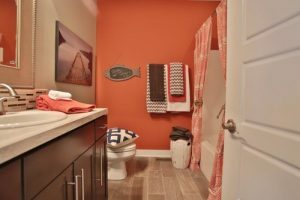 Riordan used Sherwin-Williams’ Obstinate Orange in a small guest bathroom recently. “This deep, multidimensional color receded into the background while the white porcelain fixtures became the visual superstars,” he says. Mid Century Home with Modern fireplace painted orange HausZwei Homes Kevin Polite Solid Source Realty, Inc. Draw the eye toward and make a statement with an orange wall, especially if the idea is to use the color with intensity, offers Clark. “Otherwise, apply it in small increments, such as painted on the backs of bookcase bays, as accent chairs, lamps, or other accessories,” she adds. 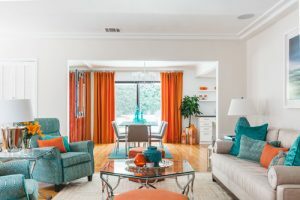 Mid Century Home with library wall painted orange HausZwei Homes Kevin Polite Solid Source Realty, Inc.
Orange pairs nicely with earth tones such as brown and beige, making it a prime candidate for a man cave or study, according to Gray-Plaisted. “Try a dark orange tone here, such as Cavern Clay from Sherwin-Williams,” she says. 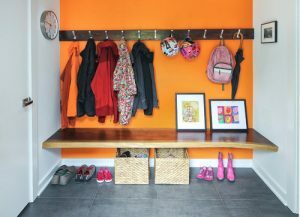 Mid Century Home with mudroom wall painted orange HausZwei Homes Kevin Polite Solid Source Realty, Inc.
Orange, like red, is an energetic color that inspires playfulness, notes Toombs. Paint this shade in your entryway, mud room, or even laundry room, which may make sorting and folding a bit less like drudgery. 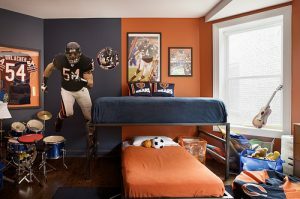 Mid Century Home with boys room wall painted orange HausZwei Homes Kevin Polite Solid Source Realty, Inc.
Who better to live with orange than your wild child? Use this punchy, exciting shade on a room for rambunctious kids, whether boys or girls. When Riordan was going through the adoption process and didn’t know if a boy or girl was coming, he painted the nursery walls orange. “We decided to toss out pink and blue and go with Charlotte’s Locks from Farrow & Ball, which was the perfect partner to our mahogany crib—and our son,” he says. Mid Century Home with orange curtains. HausZwei Homes Kevin Polite Solid Source Realty, Inc.
Blue is the complementary color to orange—but stay within the same saturation when you mix the two, say the pros. “You can accomplish this by choosing an orange and a blue that are in the same section of the paint chart in stores,” says Toombs. Orange and aqua are fabulous together, says Novak. “If you already have these tones in your room, enhance them with a dash of orange in a pillow or table runner,” she says.